I had the privilege of helping Amy and Andy plan their wedding. I knew Andy from Church. He was a friend of my husband, but I didn’t know him that well, and I didn’t know Amy much at all. But the planning process has a way of making people get to know each other. Although the bride is whom I usually plan with Andy was a planner at heart. Amy got to share her vision, and Andy helped to make it come together with some I Do…Weddings help. 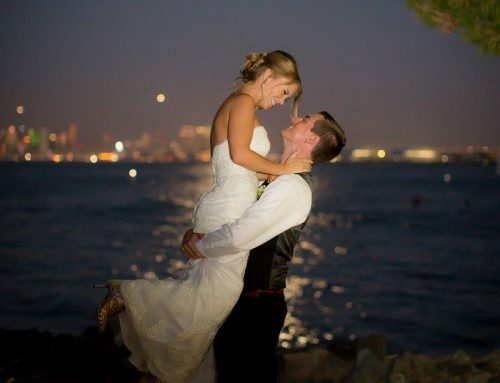 Amy and Andy got married at Scripps Seaside Forum on February 28th, 2014. 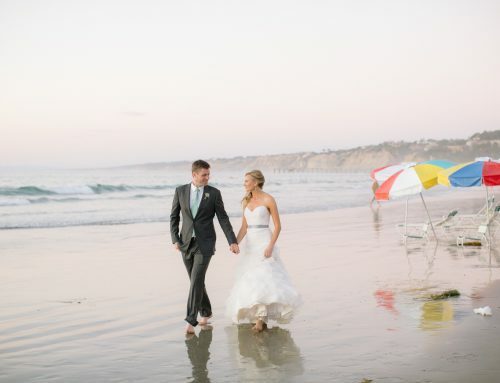 They had people flying in from all over the Midwest, and they wanted to treat their guests to a beautiful San Diego outdoor wedding. There was a small issue with the weather… It was the worst storm of 2014! The Palm trees outside where they were supposed to get married at were bending over from the crazy wind and hail coming down. Rain pelted down making it impossible to hold the wedding outdoors. With some quick thinking and great hands on action we were able to move the whole wedding indoors. Melissa Barrad of I Do…Weddings did the florals and she provided little extras to make everything special. We set up the whole ceremony inside of the 180-degree glass doors. White pillars with large glass vases were adorned with beautiful white and crème florals framed the couple as they said their vows. We made an aisle for the immediate family to sit in and guests took their seats at the guest tables in the Forum. It could have been a disaster for the couple, but because they were flexible, and so excited to get married they allowed me to create a contingency plan that still made their day special. The skies opened up after about an hour after the cocktail hour, and it made for some beautiful sunset photos for the couple. Taylor Abeel the amazing photographer got creative with his photographs to make the couple’s dreams come true. So in the end their guests got the San Diego wedding that they dreamed of, with a few adjustments. You would have never guessed that their day went any differently than they had planned for a year. Simple but beautiful white florals brought some elegance to the guest tables, and lots of candlelight made for a romantic ambiance. Guests dance the night away as the couple enjoyed the first few hours of their married life. This wedding was a perfect example of how plans may change but a wedding can be beautiful in any circumstances. Thank you to all the amazing vendors who came together to make Amy and Andy’s wedding a success!